Ads on television are never fun to have to sit through in most cases, but they're a reality of the business. Occasionally, ads have make incredible impact and become part of pop culture history - such as Apple's "1984" ad. Ads have become less and less creative and more and more hyperactive nonsense, but they're certainly not going anywhere. "Who Do You Think You Are?" (adapted from a British series) is effectively a promotional tool, as well, although to its credit it's at least far more subtle about it. 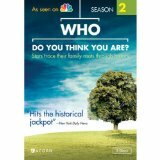 "Who" is a "partnership" between NBC and Ancestry.com, a service that allows people to search for a detailed family history. In the case of the series, we see various celebs meet with representatives in order to discuss various historical data that have been dug up about their family members. To the show's credit, it's well-produced, with the celebs often going to multiple locations to learn about their family members. Additionally, the show gets points for its straightforward presentation - it could have chosen to really pull at the heartstrings with score and the whole nine yards on several occasions each episode, but instead lets the celebs do the talking. Things aren't sugarcoated, either - findings are at times shocking, exciting, saddening and remarkable. The celebs go through pride, happiness, sorrow and more as they progress throughout the search for their ancestors and there's certainly some very emotional moments. Lionel Richie's exploration of his great grandfather's past is particularly powerful. Gwynneth Paltrow's episode, while interesting, is a little more dry. Kim Cattrall's look at the actions of her grandfather and Ashley Judd's view to her past are a bit more compelling. Additionally, it's pretty remarkable (insane, even) what the investigators are able to dig up from decades and decades prior. Overall, I'm still rather irritated by how advertising is increasingly moving into shows themselves, but "Who Do" really does manage to dig up some amazing historical nuggets and handles the material in a respectful, compelling way. Episodes this season: Vanessa Williams, Rosie O'Donnell, Kim Cattrall, Tim McGraw, Lionel Richie, Steve Buscemi, Gwyneth Paltrow and Ashley Judd. VIDEO: 1.78:1 anamorphic widescreen presentation from Acorn. Image quality is perfectly acceptable, appearing broadcast quality throughout. Some minor softness is seen, but the picture otherwise looked clear and detailed. Colors looked natural and accurate, with no smearing or other faults. SOUND: Crisp, clear stereo audio. Final Thoughts: A couple of the episodes are a little on the dry side, but otherwise, "Who Do You Think You Are?" does manage to dig up some remarkably detailed facts regarding the past history of family members of a series of celebs. Recommended for fans of those featured.